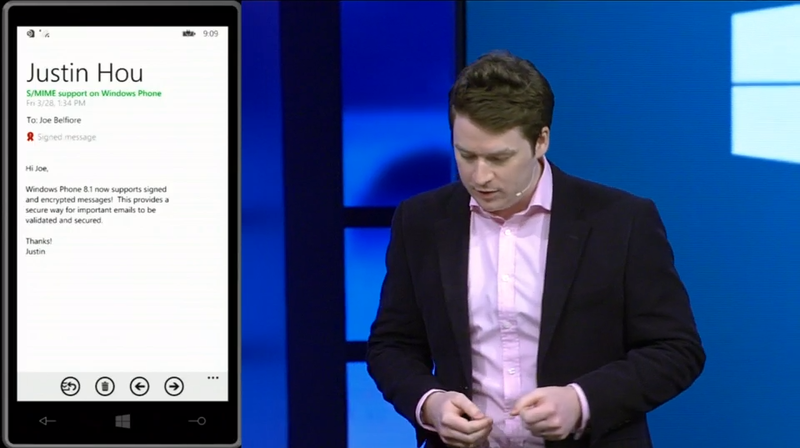 At its Build 2014 conference today, Microsoft underlined new enterprise features in Windows Phone 8.1. These include support for enterprise VPN, S/MIME encryption, and new mobile device management (MDM) capabilities. Nick Hedderman, a global product marketing manager at Microsoft, showed off each of the three on the fly. The first was enterprise VPN, which means the user can access sites strictly for employees. It uses the standard browser and allows users to bypass firewalls. Taking this one step further, users can swipe down and access the new Action Center – Microsoft’s equivalent of a notification center – and save VPN as a shortcut. The company is adding S/MIME too, which gives business users the ability to access and read encrypted email on their device. Furthermore, it’s possible to encrypt and sign emails that are sent from their handset. Hedderman showed this off in a quick demo, where a new certificate ‘S/MIME support on Windows Phone’ is portrayed prominently at the top of the screen. It’s not an all-or-nothing option though. Windows Phone 8 users can choose not to encrypt messages for families and friends, which should prove useful for people who use their business phone for personal reasons too. New MDM options, meanwhile, will give companies greater control over what information the user can access. In one example, Hedderman showed how the user would be unable to save a confidential image attached to an email – the option is simply grayed out. App access can also be denied in a similar fashion. Handsets can be returned to their original state either remotely by the employer, or by removing the enterprise profile under ‘Workplace’ in settings.